The HellCraw has been one of Anthony Hipp's favorite subsurface flies for smallmouth bass for more than ten years. The HellCraw, tied in various sizes and colors using a variety of materials has also taken its share of other warmwater species. 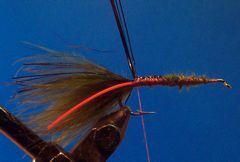 Some of the information found on this page was first published in a feature article by Anthony Hipps titled "Tying Hipps's HellCraw" in the Spring 2007 Fly Tyer Magazine. If you don't subscribe to Fly Tyer, you should. Each issue features at least one warmwater fly pattern along with other pages chucked full of great fly tying tips. To learn more about Fly Tyer magazine click on the link below. Underbody Lead Wire or substitute .025 dia. The HellCraw is a style of tying, not an exact replica of a hellgrammite or crayfish. The pattern, depending upon the size of the hook and the colors of materials used, could also suggest several other aquatic organisms including stonefly, mayfly, and dragonfly nymphs. The fly is easy to tie and consists of materials that are readilly available at your local fly shop or from mail order outlets. If you can tie a Woolly Bugger, you can tie the HellCraw. As you can see I use different sized hooks and a wide variety of materials and colors of materials to tie the HellCraw. Marabou, Flashabu, legging material, and Chenille come in a rainbow of colors, so you can have fun tying a variety of fish-catching flies. If you choose to fish the HellCraw as a dropper off a surface lure don't add lead or other weight to the hook's shank. The hook I generally use for the HellCraw is the Mustad 79580 but you could also use a Mustad 9671. If you want to make the fly a little longer I would suggest a Mustad 9672 or a Tiemco 5263. 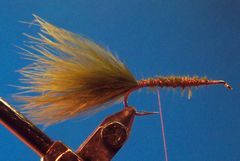 The HellCraw in the tying instruction has a olive Marabou tail, with two strands of orange round rubber, and a brown Flashabou tail topping. The body is rootbeer Estaz with brown round rubber legs. Editor's Note: I have used the HellCraw with great success. The two color patterns that I prefer are black and purple, and rootbeer and Bronze. Both are tied on a 3X Tiemco 5263 hook. The black HellCraw has a black Marabou tail, purple Flashabou tail topping and carapace, purple rubber legs, and a black Estaz body. 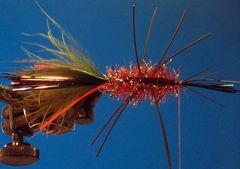 The rootbeer HellCraw has a brunt orange Marabou tail, bronze Flashabou tail topping and carapace, brown rubber legs, and a rootbeer Estaz body. The first time I fished the Rootbeer HellCraw I caught 20 "smallies" in about three hours of fishing. I have also caught catfish, largemouth bass, and bluegills on both color patterns. If you don't have purple or brown rubber legs or purple or bronze Flashabou in your materials cabinet, don't despair. Simply color those materials with an appropriate Prismacolor waterproof marker by painting pearl Flashabou and white rubber legs with the markers. The HellCraw is effective fished dead-drift uder a strike indicator, swung across the current, or retrieved with short strips. Fishing it with short, fast strips imitates a fleeiing crayfish and often entices rod-jolting strikes. 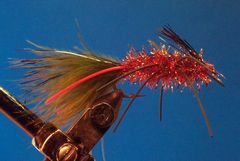 The HellCraw works in both shallow and deep water, and is an excellent pattern to fish as a dropper beneath a popper or large dry fly. My favorite body colors for smallmouth bass are rootbeer, black, cream, olive, and smoky gray. Tie weighted HellCraws for working deep in the water column, and make a few unweighted flies for fishing shallow or as sunken droppers behind your favorite floating pattern. Clamp the hook in the vice and crimp the barb. Wrap the hook's shank with medium lead wire or a non-toxic substitute. Position the lead wraps in the middle of the hook's shank. Cover the lead wraps with tying thread. Tie in a clump of olive Marabou for the tail. The Marabou should be roughly as log as or a little shorter the the hook's shank. 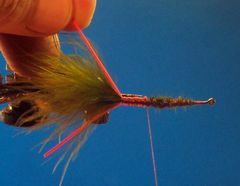 Tie in an orange medium rubber hackle strand on each side of the hook's shank. 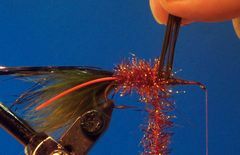 The rubber hackle strands represent feelers or claws and should be at least as long as the Marabou tail or a little longer. The photo is a view from the top to show how the rubber is attached. Tie in about 20 strands of brown Flashabou at the base of the rubber strands allowing the flashabou tail topping to extend over the Marabou as part of the tail. Make sure that the remaining Flashabou is long enough to fold over the body later to form the carapace. Tie in a piece of rootbeer Crystal Chenille at the base of the Flashabou tail topping. 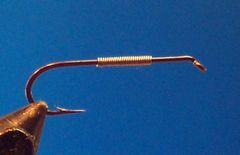 Advance the thread to the middle of the hook's shank and tie in two strands of medium brown rubber on each side of the hook as shown. Cinching the thread down hard will cause the rubber hahckle strands to splay out. The photo is a top view of the HellCraw. Pull the rubber legs up with the the fingers of your free hand and wrap the chenille forward to the legs tie-in point. Use the chenille wraps to brace the rubber legs in place. Wrap the chenille between the rubber legs, then to the front of the hook and tie off the chenille. Cut away the excess chenille. When the chenille is properly wrapped, with one wrap between the legs, the legs are then positioned in a splayed "X" fashion as shown in the photo. Now form the carapace by pulling the Flashabou strands over the top of the body and bind down the Flashabou at the hook's eye as shown. Fold the Flashabou strands back over the top of the body and tie them down as you make a neat thread head. Trim the Flashabou to about one-third to one-half the length of the body. Coat the thread head with cement and your HellCraw is finished.